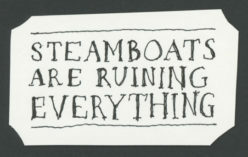 Steamboats aren't ruining everything… blogs are. This is a good article of thoughts of how tradtional print media must shapeshift to survive. The old models don't work. The article on Newsweek in the Sunday Times was good as well. Next Next post: Why not ask for more?